What Percentage of Your Total Calories Per Day Should Come From Protein? A relatively high percentage of kale's calories come from protein; however, the leafy green contains so few calories that it only contributes a small amount to your daily protein needs. As with most other plant foods, the protein from kale isn't complete, meaning it doesn't contain all of the essential amino acids. But Columbia Health reports that eating a wide variety of foods each day generally provides the full spectrum of amino acids, even if most of your choices are incomplete when eaten alone. 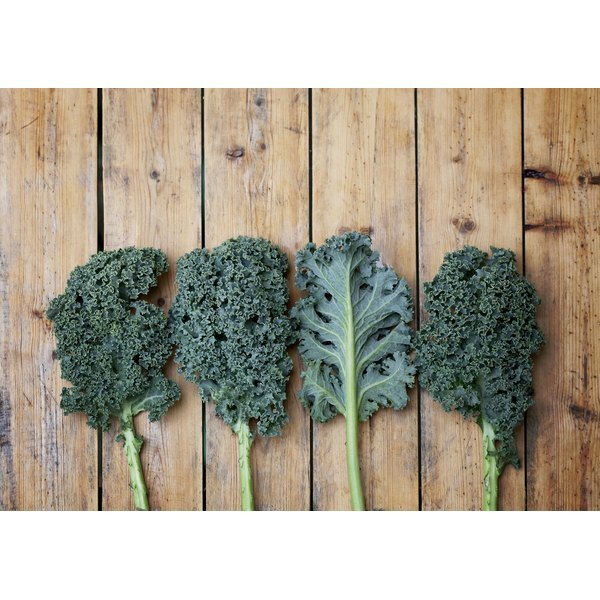 A half-cup of cooked kale contains 1 gram of protein, contributing 4 calories to the serving's 18-calorie total. The Centers for Disease Control and Prevention recommends getting between 10 and 35 percent of your total calories from protein. Kale will make up just a small fraction of your total calorie intake -- which may be 2,000 calories or more -- and the CDC reports that the average woman needs 46 grams of protein per day, while the average man should get 56 grams. Go Ask Alice: Complete and Incomplete Proteins in Grains and Vegetables?